With a circumference of 27 kilometres, the LHC (Large Hadron Collider ) is the largest and most powerful particle accelerator in the world.. The LGC is on the Franco-Swiss frontier and is the responsibility of CERN. The first beams of particles, protons, travelled round it on 10 September 2008 and the first collisions were produced on 30 March 2010. Beams of protons (going at 99.999999 % of the speed of light) and even heavy ions circulate in it when it is working. The aims of the LHC in standard physics are to detect the Higgs boson and to study quagma, a plasma of quarks and gluons produced by the collision of heavy ions. The detection of the Higgs particle is required to completely validate the standard model for the electroweak interaction in QCD. The quagma is a hadrionic state of matter that should be found in some neutron stars and during the first moments of the universe. It will be studied with the Alice detector. As for non-standard physics, the possibilities are vertiginous! First of all: the detection of supersymmetric particles in the standard model should be the subject of most of the attention; this is the task of the Atlas and CMS (Compact Muon Solenoid) detectors. Finding the Higgs particle should give us an important key to understanding the mass of the particles in the universe and perhaps the nature of dark matter. LHCb (the LHC beauty experiment) should also tell us something about supersymmetry, but its main objective is to understand CP violation, vital to solving the matter/antimatter asymmetry problem. Secondly, revealing extra spatial dimensions, and even detecting the creation of mini-black holes, with Atlas and CMS, are among the most exciting possibilities. String theory could even be confirmed! 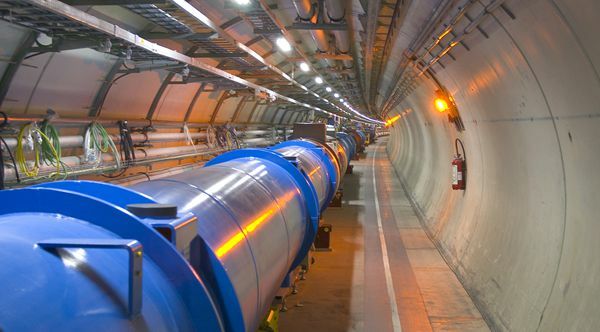 Barring surprises, it will probably not be until the end of 2012 that the LHC will have collected a large enough quantity of data to test these theories, which are still highly speculative. The frequency of revolution is 11.2 kHz (11 200 times per second). The LHC superconducting magnets are cooled to 1.9 Kelvins with superfluid helium at atmospheric pressure. 450 2 tonnes vehicles of moving at 100 km/h. The metabolising of 70 kilograms of chocolate (counting the calories); the energy in the chocolate is released rather more slowly than in an explosion of TNT! That required to bring 1 cubic metre of water to 85°C or to prepare 1 tonne of tea.